Is It Okay To Laugh? Brace yourself for the impending student uprisings that are brewing on your campuses, that is, if they aren’t already in full swing. And when I say ‘brace yourself,’ you may be surprised by what I mean. In my (dominant white) cultural upbringing, bracing myself meant steeling myself, hardening myself to cope with an incoming force, an inconvenient differing of opinion, an annoying challenge to my vision of how things should be. Is that true for you too? Because bracing oneself in this sense of the term would be the worst possible strategy in this moment. What I’m suggesting here is that bracing yourself to respond to your students’ demands will require forgetting most of what you know. Brace yourself not to harden but to soften. Brace yourself to feel strength not in hierarchically assigned power but in humility. Brace yourself to transform from a leader who knows and commands, to one who listens, learns, and collaborates. I expect it will be immensely uncomfortable. And that’s kind of the point. On your campus, there is a dominant culture that allows those who fit into it — visually and culturally — to live and learn in disproportionate comfort. For those who once quietly suggested campus climate change, and are now robustly demanding it, living and learning in disproportionate discomfort has been the toxic norm. Responding to this comfort imbalance is the most essential and immediate shift you can make. And it will start with you bearing discomfort. Culturally competent leadership looks little like the hierarchical, I Am Your Trusty Leader, leadership that I was raised on. It doesn’t begin with an in-group huddle followed by a polished letter declaring how much you understand the situation. That is fuel on the fire. It starts with quiet gatherings with those you’ve been taught to devalue and an admission about how little you understand and how ready you are to learn. 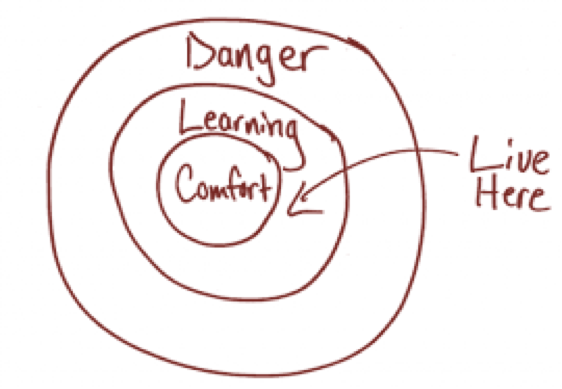 Should you step boldly into your learning zone, you will want to leave behind many of the cultural norms that trapped you in your comfort zone in the first place. Below is a list of what those norms might look like, and what transformative alternatives you might embrace instead. Brace yourself for a paradigm shift in which you learn that your protesters hold the key to your institution's future. They are the most likely to have the necessary insights to dismantle the institutional and cultural barriers that have created and maintained comfort and other institutional inequities. Contrary to all you’ve been taught, your protesting students are your greatest resource at this moment. And yet, they likely feel little trust in you, or people who look and act like you. There’s hundred of years worth of reasons not to. It’s been profoundly unfamiliar and uncomfortable for me to understand the stereotypes that come with white skin and class privilege. It’s been even more uncomfortable to learn to think and act in ways that defy them. 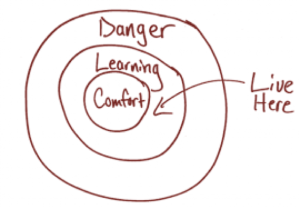 Rebuilding trust begins with embracing this paradigm shift and tolerating the discomfort that comes with stepping into a learning and connecting zone that your position of power has shielded you from. The stakes are huge for all involved. 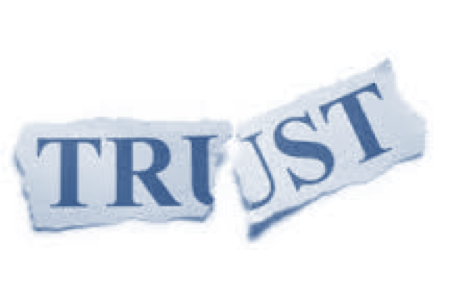 Donors and alumni will pressure you to hold in place status quo values and behaviors. Making your financial base uncomfortable may threaten your sense of existence, and possibly your job. This is what you have in common with your protesting students – the right to exist. This is exactly what’s at stake for all – the right to exist, equally. How will you negotiate this? In this moment of crisis, you have a choice. The comfortable choice may be to double down on the strategies that got you into this position. There is little separation between the hierarchical position you are in and the position of crisis you are in. Both are born of a system and culture that leverage power to hoard resources, rights, status, and comfort for some, at the expense of others. The second choice is to embrace transformative ways of thinking and acting, starting with yourself. The good news/bad news for you is that the students protesting on your campus are strategic, organized, energized, and wise. The institutional values your mission statement purports are the values they seek. They are holding the institution accountable by holding you accountable. If you can’t figure out how to deliver on your institution’s value statement, they will figure it out without you. Let University of Missouri serve as Exhibit A. May you choose to join your protesting students on a common ground where listening and learning lead the way for a more balanced existence for all. And may you become a model student in the name of bringing your institution closer to its own ideals. Hi, there, Debby, my so, so very dearly special and so very dearly precious white friend and sister who you are For Always so, so very much!!!!!! Wow, wow, wow and wow and wow and a zillion wows, sister, I so, so very much love and like this magnificent such speaking truth to power blog post article of yours a whole bunch! You are for sure here telling it just like it is, my so very dear friend! Debby, you are just so right on when you say that for white persons to brace yourselves as if white persons were to be hardening yourselves to face an incoming and confronting force would not be as productively proactive of a response. Wow, you are so right that it is very vitally important, necessary, and urgent to meet the demands and protests of the nonwhite students and other persons of color with a very open mind and heart being receptive to learning, listening, and growing in senstive awareness as white persons. 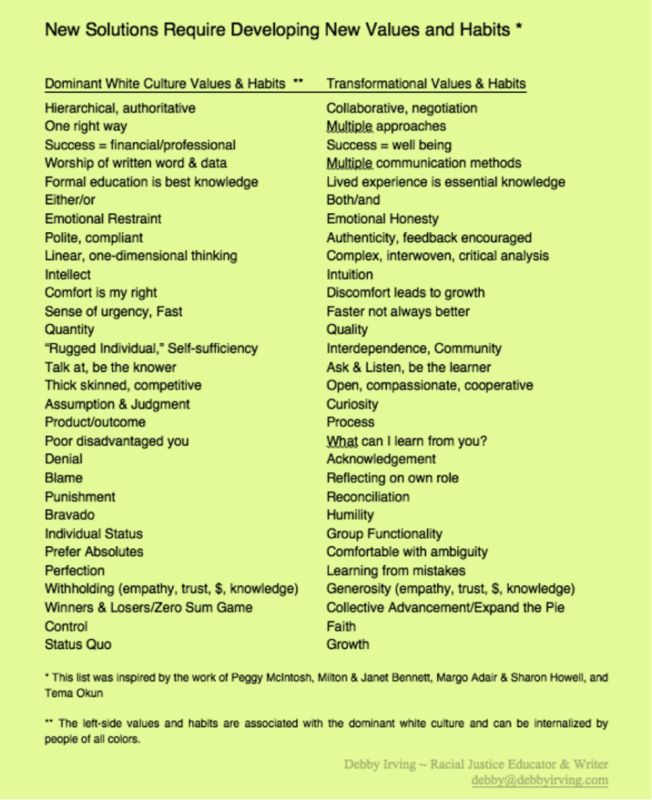 Debby, I so, so very much love your drawing here, picture, and the great list you have that describes, explains, and outlines dominant white cultures' values and habits in unique comparison to transformative values and habits! What a very powerful list you have here, sister! You, my precious white friend and sister Debby, and other marvelous white persons will for sure even with the temporary dissonance white persons may feel from being challenged to be more sensitively and racially aware with white leadership and in general for white persons from this challenge will only be all the better for it as whole and healing human beings who find yourselves in learning, growing, and healing. I am for sure, sisterfriend Debby, here for you, sister, and for all of my other dearest and darling white persons so very delightfully cheering all of you on as each and every one of you find yourselves and in the very process become racially whole and healing persons in your very process, in your very hearts, minds, souls, and very spirits!!!!!!! Your very astounding blog post article advocating for a more balanced existence for all of our human family just went straight to this black woman's very heart, and very heart, soul, and spirit!!!!! I thank-you so, so very much and so, so very profusely for this very absolutely amazing blog post article of yours Debby, for all of your other remarkable writings, and for all you do so very well in such very fine and excellent fashion, sister!!!!!! You have made my day even better and brighter with this great blog post article of yours, my friend!!!!!! Debby, you and my other splendid white allies and activists in solidarity just keep my For Always very faith and hope alive with my positive optimism!!!!!! Thank-you so For Always, Debby!!!!!!! Thanks debby for reaching out to learders who could effect so much positive change, if they have courage and will listen and engage. I am proud of the students for demanding their voices be heard. BRILLIANT….thanks for this nuanced and loving re-framing, Debby! Very well written and thoughts that I will be sharing with the adults on my private boarding high school campus. These are words that need to be said and warnings that need to be heeded. Thank you for this. This is everything!